It’s easy meal week…. why? Because it’s been a hell of a week! First up, Crock Pot Rotisserie Chicken. This is one of the first flavorful dishes I made when my husband and I went gluten and soy free. This is super easy because you only need 2 ingredients; plus, we usually have enough left overs for a few meals. This recipe calls for a whole chicken but you could also use a whole chicken cut up, bone-in chicken thighs, or even chicken breasts – I personally would recommend utilizing pieces of bone in, skin on meat. If you cook bone-in pieces don’t throw out the bones…. in fact, don’t even clean the Crock Pot and check out my post tomorrow to see how to use these to make home made gluten free, soy free chicken broth! 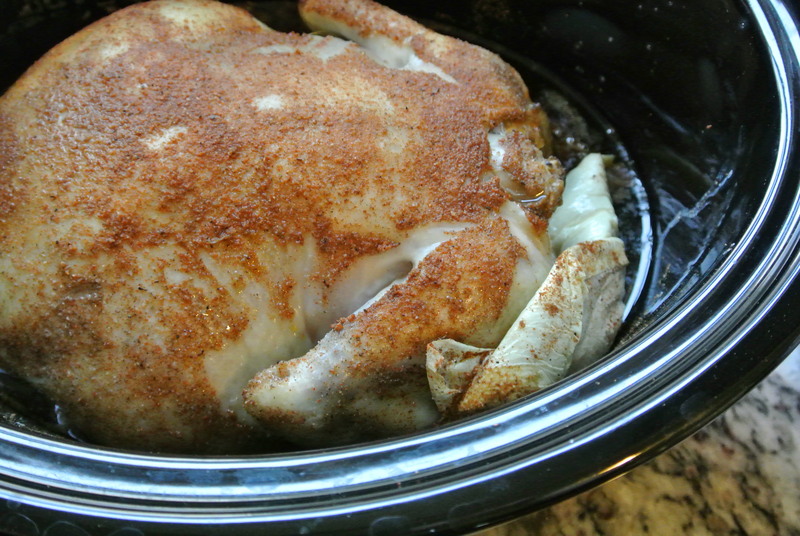 Place the whole chicken or chicken pieces into your Crockpot and sprinkle with 3 tbsp of your “Everything Seasoning”. Cook on low for 6-7 hours or on high for 3 hours. Enjoy and don’t throw out those bones! 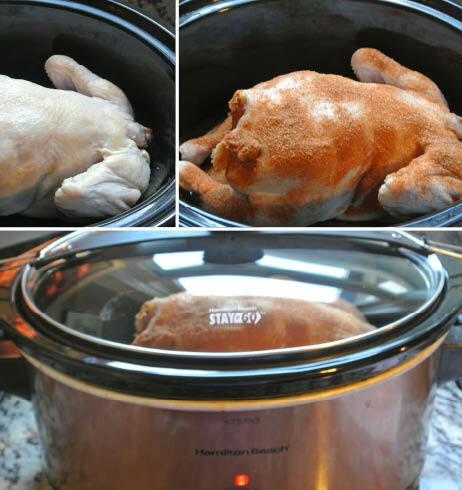 Make homemade chicken broth in your Crockpot! The holidays were great! I got to spend the weekend in the Detroit suburbs with family. The baby handled all of the holiday hoopla and long distance car rides way better than I thought he would. Then we went to Florida for a week – the babe was pefrect on the plane even though we were delayed moee than 2 hours, the weather was perfect, 80 degrees and not too sunny (which was good for my four month old that can’t wear sunscreen) theeeennn we had to try and get home the day after a huge snow storm. We got to the airport 2 hours early and found out that our plane was downsized and over sold by 26 people. My husband had a seat but me and the babe didnt. After hours of waiting we found out that there were no flights out of Florida (the entire state) into anywhere in the Midwest until Wednesday. Ughhh… no way am I staying that long. In the end we stayed the night and found a flight out the next day via another airline and made it home safely. We got home last night and it’s been snowing ever since, it’s not supposed to stop for 2 days. It was also negative 40 with the wind chill today. Needless to say, we are all pretty exhausted and it’s freezing… this week I’m posting some easy meals. Love that your back!! Everyone I know needs healthy AND easy! This is delicious and effortless! Feels like comfort food, but can be a staple for a healthy lifestyle! I think the biggest roadblock I see to eating well is lack of time to prepare things. Looking forward to more of your gems! !